Like many modelling fans, I started in this hobby as a child. The first time my mother bought me a Montaplex soldiers bag, could not imagine that was the beginning of a varied and lasting hobby. I enjoyed my small armies deployed on the my bed room floor and making battles that tore marbles lines and some other decorative objects. I also drew and cut my own soldiers, arming them with guns illustrations found in magazines. Those were my first action figures until Madelman appeared. I was just six years old when, after his studies in Ireland, my older brothers brought about Airfix kits of course forbidden to touch me. But they should realize how I liked, because the next year they brought me one, which quickly mounted with globs of Imedio glue everywhere. Years passed and I finally had to travel for learning English, discovering a model shop near my school, where I bought my first kits. Being a teenager, I joined the Valencia Modelers Association, where I discovered I wasn´t a freak and that this love is ageless addition to being versatile. There among others met Mr. Angel Comes (ALYMER founder), Mr. Alvaro Noguera (the world´s largest toy soldiers collector) and Mr. Vicente Mallol (flat toy soldiers manufacturer), all much older than me, but with the same passion and enthusiasm. To hold an exhibition, they were the first to collaborate and organize everything. Weekly meetings, always seemed short talking about soldiers, battles, collecting military items or looking the last paper model fallen into our hands. One afternoon Mr. Angel, gave me a copy of their latest catalogue which became my bedside for a long time, making dream with soldiers were then me unattainable. They have spent years and wanted the life that those dreams come true. When the heirs of Mr. Angel Comes offered Alymer figures for my collection, I thought be best to continue their work to liquidate and now I run the company as a kid made me dream. MILITARY MODELS, is the genuine heir to the legacy of Mr. Angel, also the brand, conserving more than six hundred molds, so we can offer the well known series of ALYMER and new projects. The challenge is great, because the catalogue includes N, H0, 33 mm.. 1:35, 54 mm., 77 mm. and 90 mm. as well as countless unpublished pieces. New to the brand, we offer many of our models in kit or ready to paint, hoping to enjoy the many hours of entertainment our products can provide. In 1947 the Valencian metallurgical entrepeneur Mr. Angel Comes, with the aim of creating figures for one of his great passions, strategy games, founded ALYMER. This name corresponds to th acronym of the initials of his daughters ALicia and (Y) MERcedes. The first figures were entirely made of lead and were of international 30 mm. scale. By 1949 he began a brief production of 60 mm. figures molten aluminium from the various countries involved in the Second World War; Over the years the molds were destroyed and the pieces produced are highly coveted by collectors. In 1955 Mr. Comes, large model railroad enthusiast, don´t find figures for his H0 scale trains; deciding to start his own 20 mm. figures. They are the famous MINIPLOMS quickly achieved worldwide success to develop handreds of references, from civil, military and historical themes. 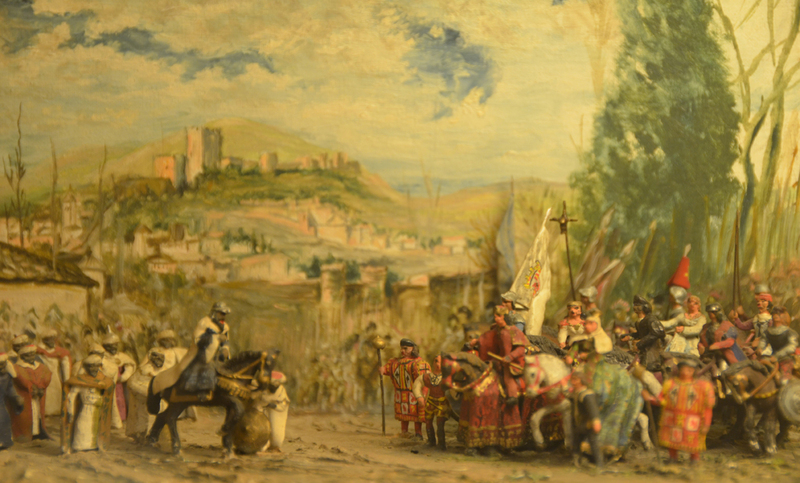 In 1956, the diorama made by the artist Mr. Regino Mas with MINIPLOMS entitled "Anibal destroying Sagunto", obtained in Paris the First World Award. The diorama was donated by Alymer to the Army Museum in Madrid. In 1960, everithing had to be plastic, so the production figures in this material began. The cost of paint were the same as for metal figures, these being more versatile and higher value added, so soon the production was abandoned. Currently they are virtually unknown. After the disappointment with plastic figures, production of the 54 mm. historical series starts. Rigorously documented that over time will be one of the most complete that can be found on the market. Soon is complemented by the ALYMER BOXED sets, presented in the traditional and elegant hand made green boxes. Mr. Comes hobby for strategy games and its belief that the limited space at home are conductive to the sale of the smaller scales, make entering the market a whole new collection of 33 mm. figures. Likewise and in addition to the many plastic kits begin to appear on the market, starts the production of 1:35 scale figures. In 2014 amateur hand Tono Martí, born MILITARY MODELS, with the intention of continuing with the production of ALYMER figures, offering a hand made product manufactured in Spain.